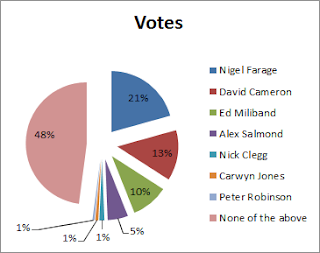 Nigel Farage has been confirmed once again as Politician of the Year 2012, this time by readers of MSN UK. Farage has already been voted Politician of the Year by Politics UK and named Man of the Year by the Sunday Times. I am delighted by this vote of confidence by the MSN readership. However, the clear message from this poll is that the entire political class is held in contempt. I am just lucky to be held in less contempt than the rest of them. With a little over a day left of 2012, the most successful year in UKIP's history, we were wondering what your UKIP New Year's Resolutions might be. Let us know in the comments below, on our Facebook page or Tweet to @bloggers4ukip using the #UKIPResolution hashtag. Nigel Farage has been voted Politician of the Year by Politics UK and Man of the Year by the Sunday Times. This year has seen one MP escape a prison sentence for expenses fraud thanks to her fragile mental health (poor lamb) and another fined and given a curfew for headbutting another MP in a House of Commons bar and telling the police "you can't touch me I'm an MP". Cameron has been caught lying to the public repeatedly, Clegg has openly defied public opinion and Miliband has finally admitted that Labour deliberately and recklessly allowed unsustainable immigration on flawed ideological grounds. On the continent, former Italian Prime Minister Silvio Berlusconi was convicted for tax fraud but will probably never go to prison because he has diplomatic immunity, the Greeks and Spaniards have been violently protesting against their governments, Spain has been bankrupted by its regional governments and the Dutch government collapsed when Geert Wilders withdrew his party from the ruling coalition. Whilst 2012 for the leaders of the LibLabCon and most of the EU can be summed up with the words fraud, incompetence and corruption, the worst accusation thrown at a UKIP politician is europhile Belgian traitor Guy Verhofstadt describing Nigel Farage as the "biggest waste of money in the EU". Under Farage's leadership this year UKIP has gone from fourth to third party in the UK, gained an additional MEP and Lord from the Tories, recruited two senior officers from Conservative Future, welcomed many defecting councillors from the LibLabCon and Greens and seen the best election results in the party's history. If anyone but Farage had won, it would be a travesty. We missed this pre-Christmas piece of election news: UKIP candidate wins big in Lancing by-election seat. UKIP candidate, Dr Sidney Hilsum, beat the Conservatives and Lib Dems in a by-election for Lancing Parish Council, taking almost 50% of the vote. Cllr Dr Sidney Hilsum becomes the third UKIP councillor on Lancing Parish Council, along with Cllrs Jean Turner and David Bamber. The council controversially didn't send polling cards to electors resulting in a turnout of just 10%. Monarch opens Cabinet - Cupboard Bare! On 18th December the Queen attended her first Cabinet meeting in 60 years. It might have been more entertaining if Prince Philip had attended as well. 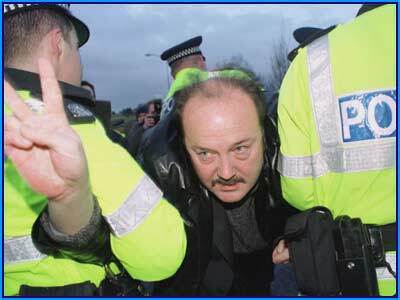 I once met him at a reception; he shook my hand, immediately spotted my UKIP lapel badge, smiled and said “Ah, UKIP! seemingly to his satisfaction. If she did she would not have received an honest answer from that bunch of weasels. If Her Majesty had come to the European Parliament in Strasbourg the week before she would have seen where real power now lies. She could have witnessed the self-congratulatory ceremony celebrating the EU’s award of the Nobel Peace Prize. She would have been shouted at in German by Parliament President Schultz as he told us that ‘the reason we have peace in Europe is because of the EU’. She might perhaps have wondered where NATO, the Rhine Army, the US Armed Forces,and others, figured in all this. Her Majesty would then have had the pleasure of listening to the Maoist President of the EU Commission Manuel Barroso, tell us how the EU intends to control the banks and the finance industry, and will require national governments to submit their budget spending plans to the EU for the ‘co-ordination of national economic policies’, with ‘increasing supervision of national budgets and economic policies’. Her Majesty might have recalled how her ancestor Henry III was forced to permit the first Parliament in 1265 precisely because the tax payers of the day refused to submit to the arbitrary power of the Monarch. She might possibly have wondered how the EUs’ plans might affect the fundamental constitutional principles of her own Kingdom. She would then have witnessed the spectacle of seeing MEPs from the Conservative, Labour and Lib-Dem parties stand firmly to attention for the playing of the EU’s Anthem, Beethoven’s Ode to Joy, while the UKIP MEPs stayed equally firmly in their seats. Citizen Elizabeth Windsor (she was made a citizen of the EU in 1993 under the Treaty on European Union) could then have settled back and enjoyed four days of debates and chaotic voting on a wide,weird and wonderful range of subjects. She could have witnessed the traitors, quislings, appeasers, and time-serving MEPs of the Lib-Lab-Con call for yet more EU legislation and vote in favour of it – and witnessed the UKIP MEPs speak out in protest and vote against it. This experience would have been more educational and informative for her Majesty than half an hour spent with the sad little bunch of men and women in her Cabinet who still try to pretend they have some control of events in their own country. For more details of the work carried out by our London MEP, please visit www.gerardbattenmep.co. Barack Obama and American officials have warned that the UK remaining in the EU is in America's national interest and that if we leave we would be seen as weaker. The Americans have taken this stance for purely selfish reasons. They like having a poodle to do their bidding in the EU which is still, despite the best efforts of the economic incompetents in charge, one of the main competitors to the US. The UK outside of the EU would be a significant challenger to the US, particularly with the Commonwealth Free Trade Area that UKIP proposes. The EU without the UK bailing it out would be much poorer and unable to buy as much American tat and don't forget that this is a socialist president supporting the socialist EU empire. You have to admire the Americans for standing up for their national interest but leaving the EU is in ours and Obama can bog off. A UKIP candidate standing for election on Thursday has had his candidacy suspended by the party after publishing a personal manifesto that included a proposal for a commission into the NHS looking at cost-saving measures including compulsory abortions for foetuses testing positive for Downs Syndrome or Spina Bifida. The party has immediately suspended him as a UKIP candidate and says that nobody was aware of the existence of the personal manifesto until Geoffrey Clark published it on his website. Ukip reject the abhorrent views expressed in the personal manifesto of Mr Geoffrey Clark, a candidate in the local elections. The party was not aware of these views when it allowed him to stand under our name. “We can confirm that Mr Clark has been formally suspended as a Ukip candidate and will not be standing for the party again. We would like to apologise to anyone who has suffered distress as a result of this matter. Clark himself has said that he doesn't personally support the idea of compulsory abortions but had suggested it as something the commission could consider. I do not endorse these ideas. They are for the commission to consider how best to cut service levels if it is decided to do so. The comments have attracted the wrath of mental health charity, Mencap and the left wing media who have been looking for a reason to talk UKIP down after recent opinion poll and by-election results have confirmed that UKIP has replaced the Lib Dems as the third party. Geoffrey Clark is contesting the Meopham North by-election on Thursday for the second time in just over a year. In October last year he came a very strong second. Meopham North is a bellweather constituency which should have given us a really good insight into the likely outcome of the next election but that's gone by this will have scuppered that. The news just keeps getting better and better for UKIP with the results of an opinion poll commissioned by Lord Ashcroft showing that 1.3m people who voted Tory at the last election intend to vote UKIP at the next. It gets better though - 86k people who voted Labour in 2010 and nearly 500k who voted Lib Dems also intend to vote UKIP at the next election which, when added to the 900k+ votes UKIP got in its own right in 2010, gives UKIP potentially 2.8m votes. People who intend to vote UKIP find a Tory government marginally more palatable than the alternative by a ratio of 6:4. This type of question in a poll produces nonsense results though because it forces you to pick a party that you don't want. These same people also prefer the Cameron/Osbourne gruesome twosome to the Labour or Lib Dem alternative but again this produces nonsense results because none of them have a clue. 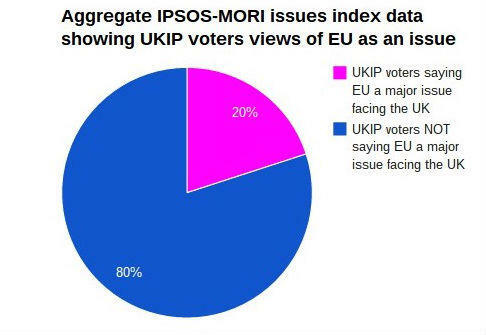 Most people saying they intend to vote for UKIP think immigration is more important than the EU and want a return to common sense and politicians listening to what they want rather than spinning bland politically correct nonsense. UKIP is, of course, the natural home for such people. You can read Lord Ashcroft's desperate search for a glimmer of hope on the Ashcroft-sponsored Conservative Home website. UKIP MEP for the West Midlands, Mike Nattrass, has rejoined the Europe of Freedom and Democracy (EFD) group in the EU Parliament, hopefully bringing an end to the slightly strained relationship between Mike and the party that started with Nikki Sinclaire's war against Nigel Farage and UKIP. Mike got caught up in Saint Nikki of Meriden's war against Nigel Farage's leadership and like many people was taken in by her dishonest and underhand tactics. In return for his support she set up a rival, single issue party to challenge UKIP at EU elections behind his back. When Saint Nikki loses her seat at the next EU election her spoiler party will collapse through lack of funding and with a bit of luck she'll disappear into obscurity. Mike's performance at the UKIP conference in Birmingham this year was excellent and rejoining the EFD group hopefully draws a line under the whole affair. 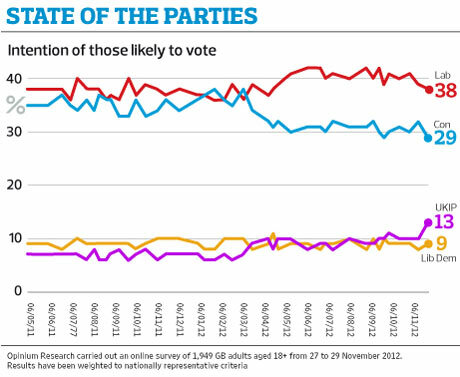 A ComRes poll for the Sunday Mirror has UKIP on 14% - 5% higher than the Lib Dems. Labour are on 39% whilst the Tories are on 28%. UKIP's place as the number three party is well and truly cemented after recent by-election results and opinion polling. The Lib Dems abandoned their principles for a taste of power and the electorate has abandoned them in return. The Lib Dems are has-been's, the next target is the Tories. There has been a lot of discussion regarding various groups that want acknowledgement as 'friends of UKIP' - many people oppose them as divisive, while others support them as 'what real parties do'. However it seems the groups themselves are confused about their purpose/scope - particularly regarding their relationship to the party and influence on policy. This group does not have an official view on the recent news re: #UKIP and#equalmarriage . We respect individual rights to their own views. We are writing to our NEC. Let us be clear: we shall NOT campaign for policies that discriminate against our - or any other - community. What I particularly don't understand is why the group talks about 'we' and 'campaigning' - do these groups have their own existance/identity rather than just being a centre for supporters to assemble around? If they are speaking on behalf of their members (as they now seem to be saying), surely it is only right that they say who those people are - if for no other reason than knowing how many people that is? James Delingpole and Iain Martin both wrote despairing articles in yesterday's Telegraph, asking why on Earth David Cameron is prioritising gay marriage now, risking seriously damaging his party at a time when so many other issues need his attention, not least our huge economic problems, the Euro-implosion and the ominous moves towards a proto-fascist European dictatorship only 21 miles across the channel. You could, of course, write much the same on a whole host of issues, from the madness of wind farms to international aid. Some see this all as classic displacement activity: the issues facing the country being so overwhelming that the government has given up trying to solve them, and instead engages in fripperies. Others see a more cynical motive, suggesting that engineering a row over, say, gay marriage conveniently redirects the public's attention from areas the government would rather we don't concentrate on. Still others, the kind who see Bilderbergers under every bed, see it all as some vast conspiracy. But I have another explanation. To my mind David Cameron, Nick Clegg and the entire Liberal elite are severely chemically addicted, and their addiction impairs their judgment to such an extent it renders them unfit for public office. I am not suggesting that Cameron spends his evenings in some seedy crack den, or Clegg his "chasing the dragon", although both images have a certain grisly appeal. No. The substance to which they are addicted is the naturally occurring hormone dopamine. Dopamine controls pleasure sensations in the brain and is linked to feelings such as high self-esteem. Not surprisingly, given their insufferably smug sense of superiority, studies have suggested that liberals have higher concentrations of dopamine in their bodies compared to conservatives. Probably this is because most such people have known nothing but easy success their entire lives, and thus think rather highly of themselves: anyone who has had the dubious pleasure of working in elite liberal circles can attest to the endless mutual ego-masturbation and self-validation that passes for discourse within them. Read the Guardian and you'll get the idea immediately. It's narcissism, in other words, a psychological condition that has afflicted increasing numbers of people from the 1960s baby-boomers onwards in our post-Christian age. But any such high, natural or otherwise, can to some extent become addictive, and the classic symptom of the Dopamine-Junkie is the inability to confront situations that do not make you feel good about yourself. Dopamine addiction affects our politics in countless ways, all of them malign. For instance, Nick Clegg was recently berated for confusing the budget deficit with the national debt. Many thought he was being deliberately disingenuous, but a far more likely explanation is that he just didn't care. To him and his fellow Dopamine-Junkies, questions of logic are just boring, sterile and dry: they don't supply the necessary emotional "hit", and therefore have no appeal. On a far more grotesque level, yesterday's award of the Nobel Peace Prize to the European Union, at the same time as violence, despair and neo-Nazi movements once again stalk the continent, is perhaps the ultimate sign of advanced dopamine addiction amongst the political elites. And those political elites exhibit other signs of advanced addiction too. Namely the tendency to mix only with other addicts, a growing lack of curiosity in the outside world and not least an aggressive denial that you have any form of problem. The rise of our dopamine-addled liberal elites is of course a tragedy of enormous proportions for our country, Europe and the world, resulting as it has in endlessly mad policy priorities. However, it does give UKIP enormous advantages we may otherwise not have: namely the widespread refusal of those addicted to believe we form any kind of serious threat. Like all addicts, they simply can not imagine a world where their highs are one day denied them. But as life gets progressively meaner and poorer for most people, there is less and less toleration for the self-indulgences of our masters, hence UKIP's rise in the polls. And all highs must end eventually. UKIP is polling 16% in the latest TNS-BMRB opinion poll - double the support the Lib Dems can expect. Labour are way out in front on 41% as is usually the case when someone is cleaning up the financial mess they leave behind after being in power but the Tories have nosedived to 26% - just 10% ahead of UKIP. Amongst the over 65 population UKIP is on 24% and this is the section of society most likely to vote. Support is pretty consistent across England with the exception of the north west whilst support in Scotland is marginally higher than usual on 6%. TNS-BMRB lump Wales in with the west of England which prevents us from getting a good view of performance in either. Bizarrely, TNS-BMRB still lumps UKIP in with the "Other" parties despite out-polling the Lib Dems by 100% and accounting for 76% of the "Other" vote. We will, of course, get in touch with the polling company to point out how ridiculous it looks and ask them to change it. Opinium got back in touch with us after publishing their poll at the start of the month to say that they would be including UKIP in all their graphics but the main one on their website was difficult because it was produced in a different way to the rest of them. It was very sad to hear of Sir Patrick Moore's death yesterday. He was one of the legends from my childhood and I would often stay up late (without my parents knowing of course) to watch the Sky at Night. Sir Patrick was also a UKIP member and patron of the party and often invited local members to his house for moral support and to hatch plans. By all accounts he was a true English gentleman and down to earth, not to mention of course being a first rate astronomer who could engage and excite ordinary people about a subject they would otherwise not even think about. An Angus Reid opinion poll has UKIP in third place on 11%, the best result UKIP has had in an Angus Reid poll. UKIP continues to perform strongly in the south of England and amongst the older generation with an even balance across all social grades - UKIP is a party for rich and poor alike. Performance in Scotland continues to be poor and as Wales is lumped in with the English midlands it's impossible to say what support in Wales looks like. Bizarrely, the Lib Dems are still attracting the student vote despite having betrayed the student population over tuition fees. An Opinium poll for the Observer newspaper is out today showing UKIP riding high on 13%, the Lib Dems languishing on 9% and both Labour and the Tories dropping by 1% and 3% respectively. Opinium have finally caved into common sense and added a purple line to their tracker showing UKIP's gradual rise in the polls in the last year and a half. What the graph shows is that UKIP's big jump in support in the first half of this year (when we started consistently polling above the Lib Dems) was at the expense of the Tories but the latest surge has been at the expense of both the Tories and Labour. 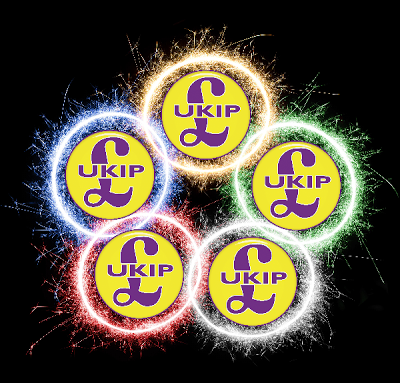 The current record level of support in the opinion polls may just be a blip thanks to the Rotherham child snatcher case and the three by-elections we've just had so we won't be cracking open the champagne just yet but if the current level of support is maintained a trend of a 2% increase in support every 8 months could see UKIP polling 19-20% by the 2015 general election. Thursday 29th November 2012 may go down as the start of a sea change in British politics. That evening saw three by-elections across England, two in the north and one in a working class London suburb in the south. Two were triggered by the deaths of well-respected local MP’s, whilst the Rotherham ballot was triggered by the resignation of Dennis McShane following a scandal surrounding fiddled expenses and false accounting – Unsurprisingly, this was the election that the media concentrated on due to the high profile nature of Mr McShane. Labour victories in all three seats were expected – The real story would be what kind of margin of victory would be achieved and how hard would the current unpopularity of the coalition government affect their support? UKIP were contesting all three seats following on from the Corby by-election of a fortnight ago where Margot Parker had polled a credible third place with 5108 votes and 14.32% of the vote – The Conservative vote dropped 15.63% as they lost the seat to Labour, whilst their coalition partners The Liberal Democrats polled less than 5% and lost their deposit. Could UKIP replicate this impressive outing and continue to push their claims as the new ‘third force’ on the political landscape? It became clear by early evening that UKIP were doing exceptionally well in both Rotherham and Middlesbrough. Deputy Leader Paul Nuttall (Above, with candidate Richard Elvin) reported from Middlesbrough that even the Labour activists were saying that UKIP were going to finish second, a result that was confirmed later on in the evening. The Buzz from Rotherham, also later confirmed, was that UKIP were pushing hard and were the main opposition to Labour retaining the seat whilst initial reports from the Croydon North constituency were that Winston McKenzie was pulling off a solid result against more fancied opponents. Middlesbrough – Richard Elvin – 2nd – 11.8% of the vote. Croydon North – Winston McKenzie – 3rd – 5.7% of the vote. In the northern by-elections, UKIP finished ahead of both of the Coalition government partners again as had happened earlier in the year in the Barnsley by-election and can now make a claim to be the main opposition to Labour in their heartland territories. In all three by-elections, the Liberal Democrats were defeated (They lost their deposits in two of the three to follow on from their lost deposit in Corby) – They have now been beaten by UKIP in five of the last six parliamentary by-elections and have consistently trailed us in the opinion polls for most of this year. Of the other parties, Respect were tipped to do well in both Rotherham and Croydon North but failed to repeat George Galloway’s shock victory in Bradford. Their candidate in Croydon North, the controversial Lee Jasper, lost his deposit and was soundly beaten by Winston McKenzie despite the presence of their battle bus on the final Saturday of campaigning where they made a concerted push and were expected to do well. The BNP vote also dropped in Rotherham despite their third placed finish and seems to confirm that their decline as an electoral force is thankfully continuing, whilst the Greens also failed to make an impact. The English Democrats were making very bullish noises in the run up to Rotherham following a second place in the recent Police Commissioner elections in the area, but despite concentrating all their resources on the one by-election they came a distant sixth with a lost deposit for their ex-Liberal Democrat candidate, David Wildgoose. The start of a new force? Whilst one swallow does not make a summer, UKIP results over the last eighteen months in local elections, parliamentary by-elections and the recent Police Commissioner elections have all shown an upward impetus. UKIP regularly do well in European elections, where we have more MEP’s than all of the other parties except the Conservatives, a position that may well be reversed in 2014 on current trends. With the Liberal Democrats in disarray as the public show them at the ballot box what they think of their broken promises, this could be the start of the break up of the cosy establishment triumvirate that have wrecked England over the last forty years. If so, our country may finally see MP’s representing them in a parliament that no longer consists of the elites from right and left but of ordinary people who are more interested in right or wrong – A parliament elected by the people of England and no longer answerable to unelected bureaucrats in a foreign country. Maybe Thursday 29th November 2012 will be remembered in history as the first step – For our children and grandchildren’s sake, I sincerely hope that this comes to pass. The author, Cliff Dixon, is a UKIP activist and chairman of the Hillingdon branch.